A three-hour martial arts movie sounds like a daunting viewing experience, I know. Traditionally, the genre's entries from the '70s and '80s aren't celebrated for the substance of their stories, either, often held together with functional tales of vengeance, transcendental training, or political scheming designed to connect vigorous action sequences across, at best, two hours. Therefore, the idea of extending one of those stories by another hour could seem like more trouble than it's worth. 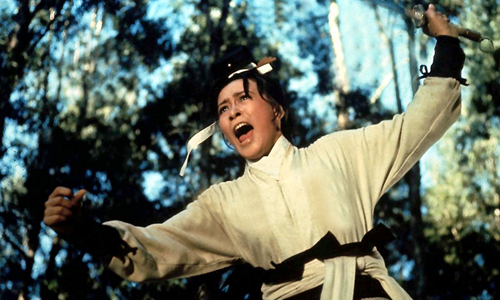 Director King Hu's prior body of work had previously telegraphed somewhat more intriguing and emotional plots, though, whether it's Golden Swallow's rescue of a captured family member in Come Drink With Me or the escorting and defense of politically-connected children targeted for assassination in Dragon (Gate) Inn. In A Touch of Zen, King Hu broadens his deeper pursuits and meticulous craftsmanship into an absorbing three hours of quaint family dramatics, mysteries of an enigmatic heroine in hiding, and stunningly-photographed fight scenes, sustaining an intriguing pace and narrative interest throughout. Beginning with images of smoke wisps flowing behind a spider's web, A Touch of Zen carefully spins its own story of maneuvers and machinations, but it starts with the depiction of a poor mother-son family living off the meager wages earned by the son, Gu Sheng-zhai (Shih Chun), a local portrait artist. Resistant to pursuing more official government work and not funded enough to be a suitable husband, he goes about his days with his aging mother constantly nagging him about his future. Between their daily spats, Gu learns that a neighbor has moved into one of the other adjacent buildings in the abandoned fort within which they live: an attractive young woman, Yang Hui-zhen (Hsu Feng), along with her equally poor family. Eventually, through his own sleuthing and discoveries, Gu learns the truth about his neighbor's identity, that she's a fugitive for being a member of a honorable family who conspired against a corrupt official. Once pursuers arrive to take Yang away, the pair form an unlikely team to combat their advances, mixing Gu's mental faculties and Yang's acquired fighting skill. Captured with broad-scoped, inherently ornate beauty by cinematographer Hua Hui-ying, A Touch of Zen relishes its introduction to these characters and deepening them within the story, flowing through King Hu's carefully crafted environment while doing so. There's a lot of detail to observe around the abandoned fort where most of the film's activity takes place, from the sun-drenched sprigs of overgrowth to the carved, weathered wood and stone making up the ramshackle residences themselves. A lot of effort was poured into making this environment look beautiful, yet dilapidated and lived-in, an environment with inherent history that's a believable living space for a penniless scholar and artist. Shih Jun's meek, wide-eyed portrayal of Gu Sheng-zhai -- his contentment with meager living and entrancement with the beauty of his next-door neighbor -- makes certain to express that he's not the warrior here, but that his constitution might become useful later on. Around him, A Touch of Zen plants narrative seeds about superstitious belief in ghosts and the artist's resistance to joining the government, connecting its introductory sequences with evenly-spaced nuances that all carry purposes. Upon the introduction of Yang, a smart layer of deceit and mystery covers A Touch of Zen. King Hu initially uses her enigmatic arrival next-door -- in a shadowy corner of the purportedly haunted fort -- to introduce the possibility of a love interest for Gu, someone of low-enough means that she'd leap at the possibility to marry, well, anyone. Gradually, once more comes to the surface about who she is and what she's capable of, that's slowly revealed to be the furthest thing from the truth: what's learned about her heritage and fighting capabilities transforms the stoic, nearly silent woman into a resolute female presence. The fastidious pacing from King Hu spurs this formation of her character by natural and plausible means through Ku's snooping, bolstered by the melancholy poise bequeathed to Yang by Hsu Feng. What begins as musings about compulsory marriage and assumed romance evolves into the development of a strong heroine from the director responsible for Come Drink With Me, driven not by a schlocky desire to have her conquer all foes, but merely to defend and steel herself against the pursuers. Confidence is required to execute a martial-arts-oriented epic without unleashing any real martial-arts action in the first hour, yet that's precisely what A Touch of Zen does, allowing the intriguing personal drama to elevate the emotional stakes that lead up to the hand-to-hand brawls and wire work. 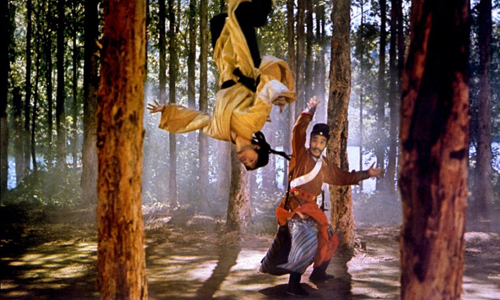 Against the shadowy backdrops of bamboo forests and throughout the mazy, unkempt space of the abandoned fort, choreographers Han Ying-jie and Pan Yao-kun orchestrate fluid, deliberate fight scenes that extends the conscientious and detail-oriented plotting that came before it, leaving few details unseen in the skirmishes. Elevated by slight touches of whimsy to wow the audience -- feet springing off blades, arrows caught mid-air -- the action embraces an exhilarating middle-ground between brisk realism and airborne beauty. These fights aren't really designed to impress those watching with how lavish or chaotic they can get, though; instead, each one carries precise emotional or thematic connections to Yang's story, making sure that none of them appear contrived for the sake of mandatory action beats. True to its title, A Touch of Zen also doesn't ignore the gravity of the violence present in the numerous action sequences, attaching philosophical meditations to the moving parts of the politically-driven adventure. From the presence of wise and vastly powerful Buddhist monks to a dreary shift from celebratory to somber tones after someone grasps the repercussions of a bloody premeditated battle, director King Hu integrates blatant observations on earthly values and the sinful motivations of men into his poetic wuxia film. They're uplifted by a distinctive, perhaps unexpected metaphorical ending that departs into more avant-garde ground than the film had previously expressed, one that craftily weaves together its subplots to form an overarching remark on principles and spirituality. Whether that'll resonate with certain viewers will, of course, vary depending on one's ability to roll with these comparatively off-beat punches, but it's hard not to admire King Hu's boldness in capping off his lengthy creation with an obscure resolution, yet another skillful way A Touch of Zen departs from expectations.